Exosomes are 60 – 150 nm membrane vesicles secreted by most cell types in vivo and in vitro. Exosomes are found in blood, urine, amniotic fluid, malignant ascite fluids and contain distinct subsets of microRNAs depending upon the tumor from which they are secreted. 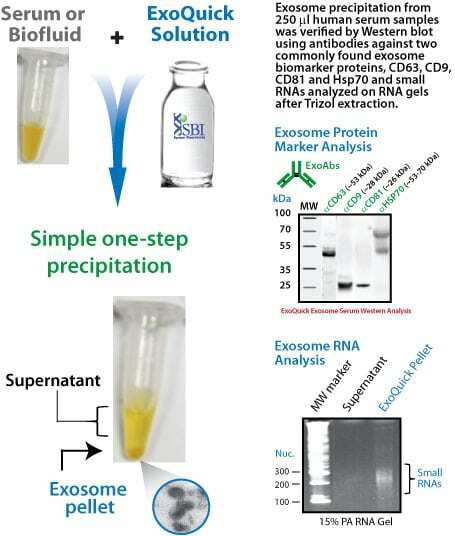 SBI’s ExoQuick exosome precipitation reagent makes microRNA and protein biomarker discoveries simple, reliable and quantitative. Enrich for circulating exosomal microRNAs with ExoQuick and accurately profile them using SBI’s SeraMir™ qPCR arrays. SBI created a stable 293TN cell line overexpressing the Cyto-Tracer™ pCT-CD63-GFP fusion protein (catalogue CYTO120-PA-1). The media from the cells was collected 48 h after plating and the exosomes from the media were precipitated using ExoQuick-TC. The exosome pellet recovered was resuspended in 30ul PBS and 10ul was added to newly plated HT1080 cells. 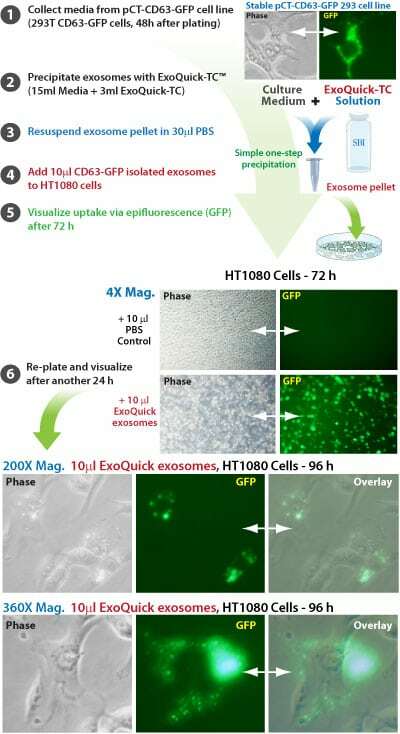 HT1080 cells were visualized 72 h after the addition of the CD63-GFP labeled exosomes and then re-plated. Following another 24h, the cells were again visualized for GFP fluorescence and imaged. The exosomes appear to dock with the cells within 72 h and some are found to be internalized after 96 h.